← Earthbag Building Has Come a Long Way! Earthbag foundations offer many advantages over reinforced concrete foundations and work well with many types of sustainable buildings. In particular, they are low-cost, fast and easy to build, require no cement (a major expense and cause of global warming), and require no forms or expensive equipment. Earthbags are simply polypropylene sandbags (rice or feed bags, for example) filled with soil, sand or aggregate obtained from or near the building site. 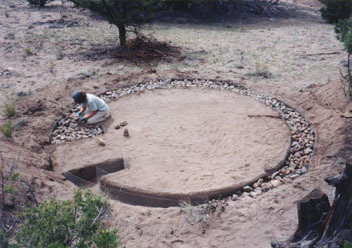 Unlike adobe or rammed earth, which require a rather specific mix, almost any type of soil or aggregate will work (expansive clay soils are not recommended for foundations). Aggregates are preferred for foundations because they will readily drain away any moisture and prevent wicking into the wall system. 1. Earthbags on a rubble trench foundation (to raise wall system above grade) – Example: an earthbag wall or straw bale wall stacked on top of aggregate-filled earthbags or earthbags filled with cement/lime stabilized fill material. 2. Aggregate-filled earthbags starting below grade and extending well above grade in flood-prone areas (reduces risk of the structure being undermined) – Example: a rubble trench could get scoured away and soil-filled bags on lower courses could dissolve in a flood. 3. Earthbags filled with scoria (lightweight volcanic aggregate) in cold climates – Example: scoria-filled bags are equivalent to a frost-protected foundation, and therefore eliminate the need for rigid foam insulation and extensive excavation. Hi my name is Jeff and I live in the southern part of Iowa. The soil is mainly clay; would this type of soil be suitable for an earthbag home? Would like to build the solar pit home but don’t know how to get a full set of plans and step by step instructions. Can you help me out? That’s one of free plans. Go to our free plans page, scroll down, and click the PDF to download. Can we use broken celcon / thermalite blocks in polypropylene bags for below ground foundation for a straw bale roundhouse? Yes, as long as the material does not absorb water. Otherwise it can wick moisture up into the wall and/or freeze and expand and break apart. If it rains a lot then the lower bags can turn to mud and cause the whole house to collapse. Use gravel or busted rubble from old buildings (no big sharp pieces).